Aberdeen Voice contributors and concerned local residents visited the public exhibition at the Menie Estate; the Trump Organisation launched a consultation for the proposed new MacLeod course – a course that will border the public Balmedie Park. 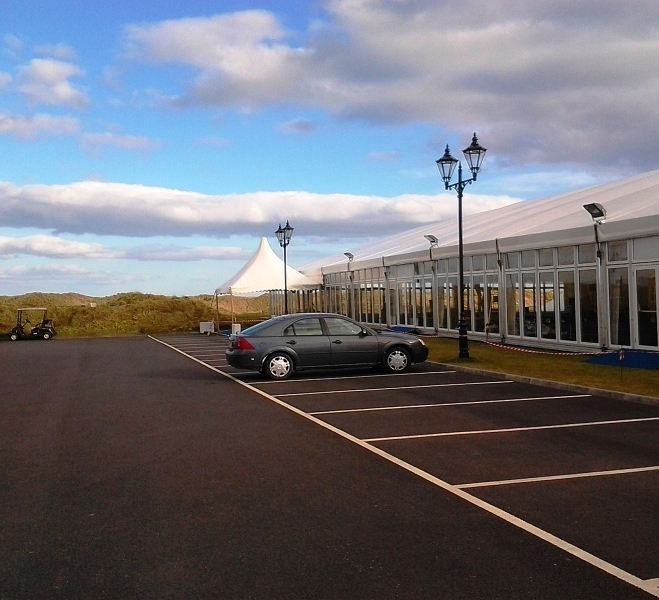 A series of tall posters stood in a Stonehenge-esque semicircle; the first one announced that Trump International Golf Links Scotland welcomed us, that one of the goals was stakeholder engagement and that a team was on hand to answer any questions. Suzanne Kelly gives her account of the visit. Detail of display banner inviting visitors to ask questions of the TIGLS team. If you had access to a car you might have made it to the Menie Estate for the public consultation on the 20th. If not, and you didn’t want to walk 20 minutes each way to the exhibition, you were out of luck. You would have driven by the overly large entrance sign, past the overly large looming clock, past the outsized (and garish it is nearly universally agreed) concrete fountain plunked in front of Menie House. 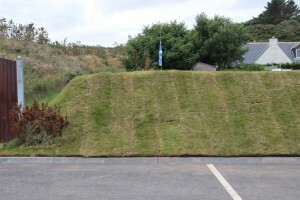 Driving past large bunds topped with turf squares (held in place by plastic pegs), you would not have seen Susan Munro’s home, which hasn’t seen much light or any of the land and seascape since Trump had the bund erected. The turf squares on your side of the bund while driving to the temporary(?) clubhouse are matched by weeds and sand on her side. Entering the large parking lot (which differs from the original approved plan), topped with strong, high lights (apparently higher and brighter than initially permitted) with more of those oversized clocks nearby, you would have walked past the temporary clubhouse to a temporary marquee, manned by a very oversized bouncer (who towered over me and I’m 5’11”) where the Trump organisation’s documents say they wish to ‘welcome’ you to the public consultation, and that they will answer questions. How are the public treated when it comes to Trump planning applications ? This video among others gives an idea. http://www.youtube.com/watch?v=u1dd0o8CkRA That video was back in 2010 – but had anyone in the Trump camp gone to charm school in the interim? Not so much. The room’s occupants included our little party, a few others, a waitress, Sarah Malone, Martin Hawtree, the designer of the previous and proposed courses. Tables were adorned with golf magazines, pens and paper, and coffee in a far corner. The centre was given over to the displays; some 12 or so panels approximately 2’ wide by 7’ tall. The promised welcome didn’t exactly seem on offer to any of us. We must have missed some form of joke when we got in, for Sarah Malone Bates, VP at Trump, and a woman who refused to identify herself were by the door sharing an intimate laugh while coincidentally looking in our direction. This anonymous woman was a spitting image of Anne Faulds, legal consultant from Dundas Wilson in Edinburgh, to Trump. Bund obscuring Susan Munro’s home from view. Faulds was famously discovered to be feeding a willing Christine Gore of Aberdeenshire Council Planning advice before the initial plan was approved – not exactly how things are meant to be done by a planning applicant. Faulds was helping Gore ‘manage public expectations’ – and many found this cozy relationship inappropriate http://www.probe-into-top-planners-collusion. After reviewing the dozen or so posters set up for the public to view, a number of questions arose based on their content. 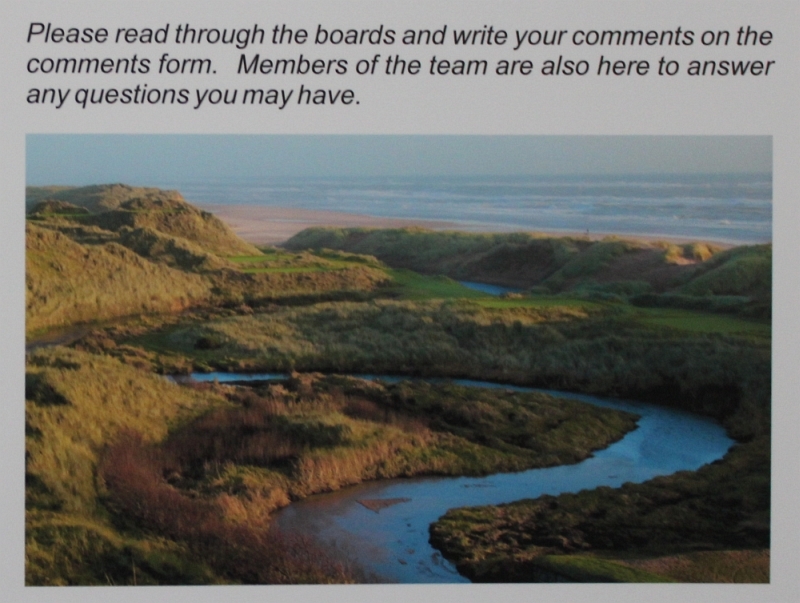 At first it was not clear where the proposed MacLeod course would end and the Balmedie County Park begin. in order to read the printed ‘Balmedie County Park’ label, I had to crouch down, for it was about 2-3” off the ground. The font size was miniscule; the text was in faint grey. Perhaps this has something to do with the Trump plan to build the course right up to the boundary of the Park. Future park users may well be advised to wear hard hats if they wish to avoid golf ball-related concussions. One of the posters carries a statement that outdoor access rights don’t apply on golf courses; this is contrary to what I believe to be right. Despite the early day promises that the courses and complex will mean millions to the local economy; only an additional 32 cars per hour are envisaged; there will not be any need for more road infrastructure it seems. An additional environmental statement will be created. The presence of otters and badgers is questioned (David and Moira Milne have a badger set on their property which the Trump organisation knows about from its tree planting activities), yet “A survey will confirm whether badgers are present on the Menie Estate.” appears on one of the posters. The championship (first) course is mentioned frequently – but the Blairton Burn area collapse is omitted, as is MEMAG, the environmental group which is now in limbo. These and other issues give me a few questions – questions which the final panel assures me the Trump organisation “hope you have taken the opportunity to discuss any issues.” and that I will use the comment form. Question time it is, then. This is my recollection of the ensuing question and (no) answer session. I poured myself a coffee (no one was going to offer us or invite us to help ourselves). Sarah Malone Bates was nearby; I asked her if someone is free to answer my questions. I walked over to the round table next to the one the Trump team were seated at. Hawtree sits on my left; Fred Wilkinson stands over my right shoulder; Anne Faulds stands behind and to the left of Hawtree; Sarah Malone stands further to their left. I ask how close the course is going to be to the public park. “It’s on the map”, Faulds answers. I say that no figures for proximity are shown, and the team confirms the course will go right up to the park border. I comment that some of the holes look very close to the water, and ask if there are concerns that there might be another course collapse like at the Blairton Burn. Hawtree doesn’t know if this is possible or likely. I get the distinct feeling this question has displeased them. I asked about the claim of increased biodiversity. Hawtree says there will be more wetlands; he adds: “The pond has migrated”. I ask about chemicals used on the estate / course. Hawtree’s answer starts by discussing agricultural chemicals. I ask about chemicals that would be used on the course not agricultural chemicals; he doesn’t know. I ask what chemicals are currently being used on the first course. “That is not relevant”, is Faulds’ reply. I ask the woman (Faulds) who has now interrupted Hawtree twice what her name is “so that I know who I’m talking to”. “I’m not going to tell you”, Faulds replies; she is (in my opinion) incredulous that as a member of a team at a public planning her identity is being asked. I recognise her anyway, and my belief in her identity is confirmed by others later. “We don’t know who you are”, Sarah Malone says. “I’m Suzanne Kelly from AV” (they all start talking at once) “I thought you knew that Sarah”, I add. I reply: “Ok, but part of this [consultation] is that you will be available to answer questions”. I explain that in the past my emails and questions haven’t been answered [I wrote directly to Hawtree in February of this year, and to the Trump Menie email address several times; I had also written to Sorial on occasion; he did reply]. I want to ask questions based on the displays. “There is something interesting on one of the boards”, I say; I ask Hawtree to come and have a look at this . The boards are about 8 paces from where we sit. Malone says, [something like you’re dragging people around…] “it’s not respectful to members of our team. We know that you have a negative impression. Yes you do”. I respond, “OK, I am not in favour of the course”. “I am being respectful”, I reply. I explain that in order to ask my next questions I need to show Hawtree what passages from their boards I wish to discuss. One board has a sentence “The Scottish Outdoor Access Code states that access rights do not apply to golf courses”. Having read a few versions of the code, this sentence is not familiar to me. Indeed, I am told that some Scottish courses openly welcome hikers and bicycle riders. I ask where the comment about access comes from. “Page 7”, Faulds replies. (I have since looked at the code, and done an internet search on the sentence to no avail. If anyone from Trump is reading this, please do send me the Page 7 link you told me about, thank you). I move further on towards the environmental boards. Text indicates they will determine if there are badgers in the area. Hawtree replies that they, “haven’t had the report back”. Which leads me to MEMAG, the environmental group mandated to oversee the championship course and its environmental issues. It fizzled out, and its status remains unclear. I can’t say it did a bang up job. Faulds comes closer and asks, “What question is that?” I am fairly certain I heard Faulds say, “Don’t answer that”. I ask “what environmental body will be the watchdog”. I mention MEMAG. There are lots of pictures of bird species; text about badgers and otters – and no mention of the MEMAG collapse or what the implications are for a second course. I had been told that some area residents believe burrowing animals had been destroyed/gassed to create the first course. I have still not found anyone to explain what did or did not happen. Again, if anyone from the Trump organisation would like to set the record straight, please do get in touch. Things were less than welcoming. I indicated I’d put the rest of my questions in writing. The P&J is already quoting its editor’s wife’s company as saying the “response so far has been favourable”. This is a quick turnaround indeed, with 6 days left to go, and the consultation not ending until 8pm last night. Sadly, the P&J didn’t find space to record its relationship to Malone-Bates or to tell us how many forms had been submitted. Thankfully, there is still time for those who could not make it to feed into the consultation. 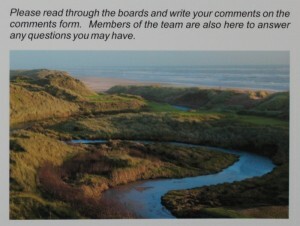 Those who wish to read the boards will not find them posted on the Internet by the Trump team, but Aberdeen Voice has captured the text and made a form available to you. 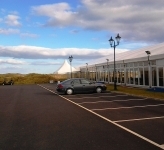 Visit this link http://suzannekelly.yolasite.com/; the form needs to be submitted to the Trump organisation (by post or email) within 7 days of the consultation. It is vital that anyone with opinions, for or against the second course, writes to the Trump organisation as soon as they can. A small sample may well be presented to the Shire as meaning ‘no one cares’, or that ‘no one has objections’. Whatever your take on this, don’t be left out of this stage of the process just because you couldn’t get a lift to the exhibition. Championship-hosting, environmentally sound, biodiversity increasing, employment creating MacLeod course? My grandmother. Public consultation is held, as I understand, for the purpose of informing interested members of the public and to afford them the opportunity to ask questions. It seems unreasonable of TIGLS to present a team to the public, which was either incapable or unwilling to answer a question about The Scottish Outdoor Access Code, particularly since they had published a statement about it and how it applies to golf courses. Would it have been too much trouble for TIGLS’ team to have had a copy to hand or via internet access? I doubt the lady, who refused to identify herself was a lawyer since even a junior lawyer or anyone interested in outdoor pursuits would have been able to answer that question. Unless, of course, this consultation process disguises TIGLS’ partiality and their disrespect for their neighbours and the public. Suzanne makes it clear in the article she opposes the course, she turned up with her mind made up, the people there are more than aware of the small group of people who continually hound the project, why should they bend over backwards when it’s clear no matter what they say it won’t make a jot of difference. I accept that TIGLS would want to put on a good show of their proposals and planned new golf course. My point, however, is simply that as part of a “public consultation” the organisation should be prepared to field questions from those who may be opposed to it. Questions about public access should be easily answered, unless there is some reason to avoid them. Perhaps TIGLS needs to try winning over those who have been hounded by the project, in particular their own neighbours at Menie. Support for them is anything but small. Was this a statutory consultation? How could you tell? Were there any officers from the council in attendance if for no other reason than to ensure that the minimum requirements of the process were fulfilled? Interesting too that both of the commentators criticising Suzanne and her journalism don’t offer up either an alternative report of the public consultation or any substantive answers to the pertinent questions that were put to the ‘professional’, if anonymous, representatives of TIGLS. I’m wondering if these critics understand the current status of communication between Aberdeenshire Council and TIGLS which is (stated explicitly in official communication from said council) – Speak to my lawyers! Is this the Aberdeen Voice or the Anti-Trump Voice as this is no more a piece on the pro’s and cons of the proposed course (which don’t actually appear to have been discussed in any way despite 2 days of posts on the subject save for an anecdotal (and unrealistic) reference to people potentially being hit by golf balls in the neighbouring country park) than it is simply a personal attack on Donald Trump, his organisation and others employed by Trump to develop the ocurse. Your site appears to pride itself on the independence of its journal which owuld suggest at least a degree of impartiality in your journal yet the last 2 days’ posts scream of an entrenched one-sided viewpoint, clouded by personal grievance rather than an objective assessment of the project as a whole. I may be wrong. perhaps you plan to offer a pro-Trump and pro-project piece in your next post? From viewing previous posts however I suspect not. It just seems a little sad that the through AV people of Aberdeen and the surrounding shire have, in theory, an independent organisaiton to report for them beyond traditional media on issues affecting their local area, but in reality it [ appears to be ] simply a blog to promote personal agendas and vendettas. By all means Steve, write your pro-Trump piece; if it is legal, Aberdeen Voice will publish it. By the way, since you object to the Trump coverage here as being bias, how do you feel about 3 days of blanket pro-granite web articles dominating the first pages of the Press & Journal? I am of Scottish ancestry, Sir William Sinclair and the Murray’s of Dunkeld, the Stewarts and Bruce’s, and it sickens me to know the Scots have sunk so low that they would let a man like Donald Trump come in and destroy the land our ancestor fought so hard for money. All of us born here in these Americas are not for the almighty dollar and the Trumps of this world. I live in New Zealand but I’m of Scottish descent. Tonight I watched the documentary “You’ve been trumped”. I was shocked and disappointed to witness such shameful mistreatment of local people in support of a man with such low character as Trump. He is so obviously a liar and a charlatan and I can’t believe politicians and police can be so easily bought in good old Scotland. It doesn’t line up with what I’ve always believed about the true blue Scot. However, the Forbes family, their neighbours and supporters gave me some comfort there are still a few canny Scottish folk left.